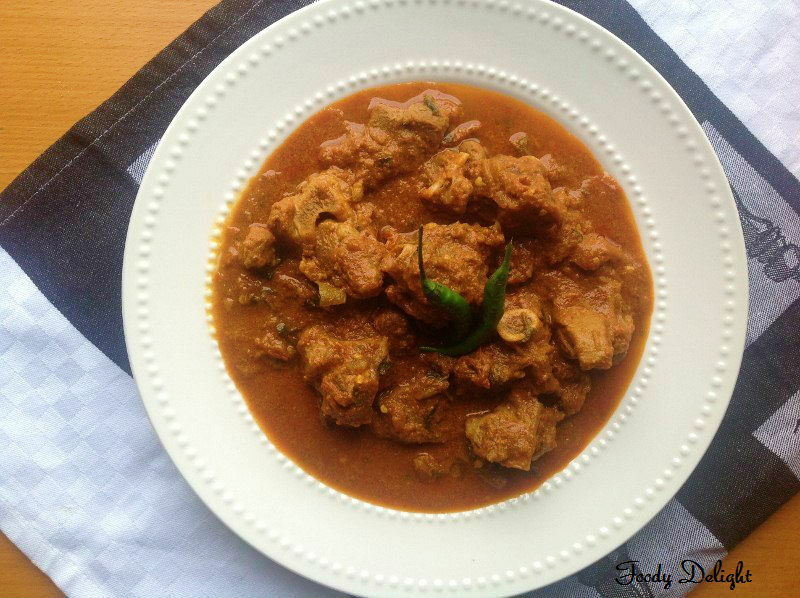 Karahi Gosht is the famous authentic Pakistani recipe. 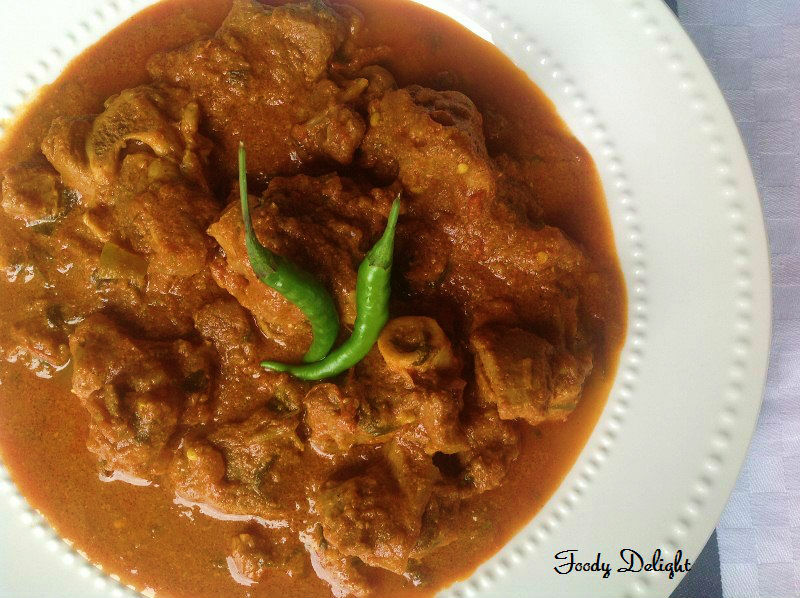 Karahi is the spicy lamb curry, where the diced or chopped lamb is cooked in the yogurt based gravy with fresh green chillies, ginger, garlic and spices. For the first time when I had tasted karahi gosht in the restaurant, i liked it so much, that I wanted to try it at home. I tried it many times but did not get the same taste for which I was looking for. Finally I found and this time the gosht was really superb. This is the very simple recipe. 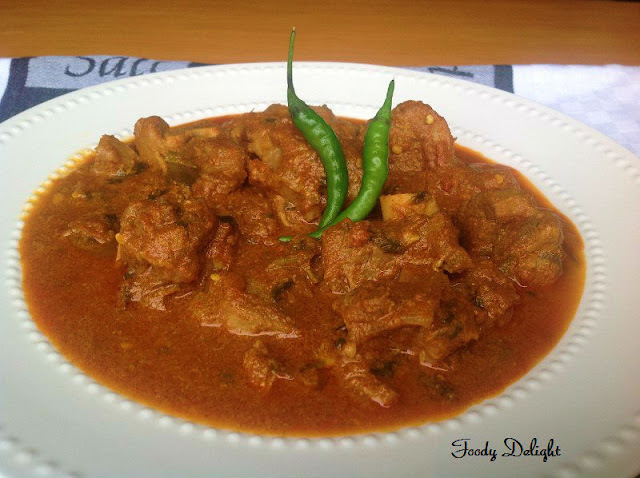 You can also try the same recipe with chicken and call as "Karahi chicken" . Do try it and I am sure you will not stop yourself to cook it again. Wash the mutton pieces(lamb/goat meat). Keep it aside. Grind the garlic cloves along with 1/2 cup of water. Place the cooker on medium flame and add mutton pieces and grinded garlic into it. Also add another remaining 1/2 cup of water. Cook the mutton in the garlicky water till the mutton changes its colour to white. Then add oil and cook again for 2 minutes. Then add diced tomato, red chilly powder, turmeric powder and salt. Stir well and cook till tomato becomes fully soft. Then add yogurt, grated ginger and slit green chilies. Mix everything well. Adjust the salt and spicyness if needed. However the above mentioned ingredients are perfect for the recipe. If needed you can add about 1/2 cup of water, not more than that because the sauce will be too thin which we do not want. Finally add garam masala and chopped cilantro. Mix well. Cover the cooker with the lid and wait till you get 6 whistles. Karahi gosht is ready to serve. Karahi gosht is served with naan, rice. Good looking picture. I never had any Pakistani dishes before. But, this looks good! Wat a droolworthy dish,makes me hungry. It just great to see variety of dishes from all over the world. Good one!